American tennis champion; first American to win the mens championship at Wimbledon in 1920. 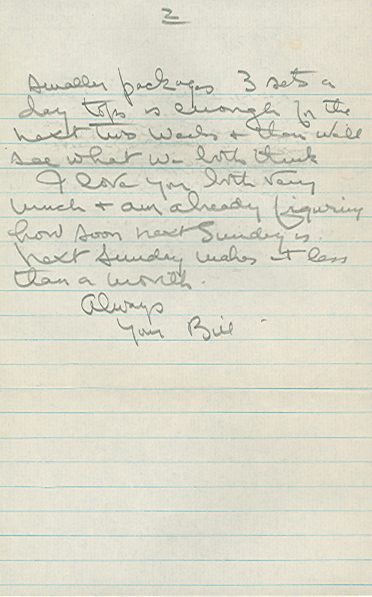 Autograph Letter Signed, Your Bill, two and one-half pages, large octavo, Saugus, California, Monday [November 14, 1949]. 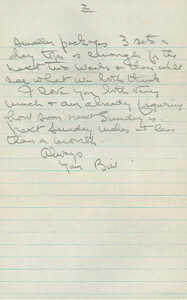 Written from prison, in pencil, to his protégé Arthur (Bratto) Anderson and his mother Marrion, in Hollywood, California. With the original envelope, signed W. T. Tilden in the return address. Fine condition. I am starting this before the mail comes so I havent the Babes letter yet telling how he came with Gibby. I have no news at all really except that Pat Rogers broke three fingers playing baseball last night. Im darned sorry about it. I still find myself grinning with pleasure to know the Brat is out of the frat situation. I am sure he will be very glad too in the end. Dont forget, Pal, that the next few weeks, you should use to prepare to be in shape for a really hard work with me at a highly concentrated pace on special shots. I will have a pretty good idea of just what we need to do & after about two days checking with you, Well get down to the real business. Between now & then store up all the weight & energy you can & above all keep your training perfectly please. Id like to see you get back to at least 160 by the time I get out. Babe your letter just came & Im proud & delighted. That is a fine performance with Gibby & I must say even better than I expected. You have really come on a long way to judge by your scores with Gib-Kerr, Bond, [Comica], Robertson etc. That gives me a real basis to judge on and I am very pleased. Now keep up the good work but in slightly smaller packages 3 sets a day tops is enough for the next two weeks & then well see what we both think. I love you both very much & am already figuring how soon next Sunday is next Sunday makes it less than a month. William Tilden dominated the tennis scene for more than a decade, winning seventy titles throughout his career, including seven U.S. championships, three Wimbledons, and two professional titles. His career was destroyed when, in November 1946, his homosexual activities became publicly known with his arrest for contributing to the delinquency of a minor of fourteen years, for which he served eight months in jail. In January 1949, William Tilden was again arrested for improper conduct, this time involving a sixteen-year-old hitch-hiker, which resulted in a term of over a year in a work camp [Encyclopedia of American Scandal].